My sister has sent another photo from the family archive. 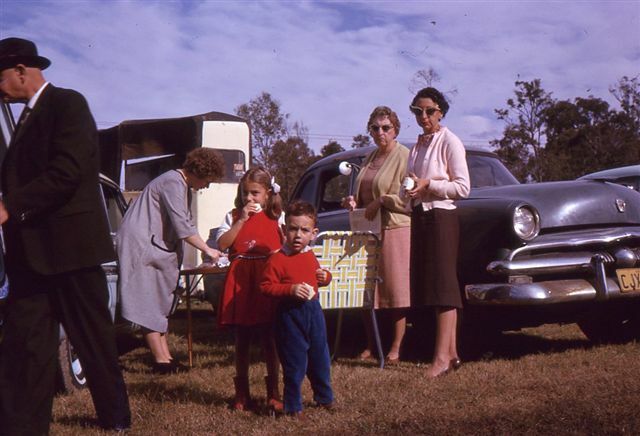 Don’t you just love the cars and those way out sunnies my nanna and aunty are wearing? Very Dame Edna. Join Melody at the House on the Side of the Hill blog for Tuesday’s Treasures. What’s your treasure? Just brilliant! Thanks so much for playing along with TT today. what snazzy ladies! and that well dressed gentleman with suit and hat. The kiddies look pretty smart too.